Be the first to share your favorite memory, photo or story of Renee. This memorial page is dedicated for family, friends and future generations to celebrate the life of their loved one. Renee McRae Sparks, 53, passed away on Tuesday, February 5, 2019 at UNC Hospitals in Chapel Hill surrounded by her family. Renee’s faith in our Lord and Savior Jesus Christ was her anchor. Her sincere smile, enthusiastic love of life, and concern for all people endeared her to those she met. She loved everyone, encouraged others, and had abundant energy. Renee was born in Wilson County on February 25, 1965 to Patricia Pittman McRae of Goldsboro and the late Charles Bruce McRae. 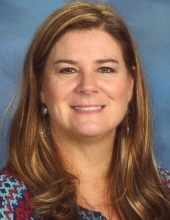 Renee enjoyed the opportunities given to her by helping to impact the lives of so many children while a teacher for Wayne County Public Schools and most recently at both Grantham Elementary and Middle Schools. For those who knew Renee, she will be remembered for her dedication as a teacher and as a mother. She will be missed by many. The love in Renee’s life were God, family, and friends. Even during her illness she never gave up or let go of her firm belief in the power of prayer. Renee’s determination to let it be God’s will was an inspiration to all who knew her. She was a member of Love Memorial Baptist Church. Renee took great pride in her son, Matthew and loved watching him develop into the fine young man that he is today. Her daughter, Casey, provided many happy days and smiles that only a mother would love. Renee enjoyed scrapbooking, horses, animals and spending time at the beach. Above all, she loved spending time with her family and friends. She will be missed. The family will receive friends on Monday, February 11, 2019 from 6:00 – 8:00 p.m. at Seymour Funeral Home. A service to celebrate Renee’s life will be held at 11:00 a.m. on Tuesday, February 12, 2019 at Love Memorial Baptist Church with Rev. Richard Toler, Rev. Frank Purvis and Rev. Steven Burrow officiating. Interment will be in Wayne Memorial Park. In addition to her mother, Renee is survived by her husband of 29 years, Jeff Sparks; son, Matthew Ryan Sparks; daughter, Casey Nicole Sparks; sisters, Ann M. Smith and husband Chris and Leigh M. Cox and husband Dean; and her niece and nephews, Maggie Smith, Blake Smith, Josh Cox and Drew Cox. She is also survived by her mother-in-law and father-in-law, Evelyn and Bob Sparks; brother-in-law and sister-in-law, Craig and Kim Sparks and their children, Tim and Tyler. In lieu of flowers, memorials may be given in her memory to the Lineberger Cancer Comprehensive Center (https://giving.unc.edu/gift/renee) or to the local charity of one’s choice. To send flowers or a remembrance gift to the family of Renee McRae Sparks, please visit our Tribute Store. "Email Address" would like to share the life celebration of Renee McRae Sparks. Click on the "link" to go to share a favorite memory or leave a condolence message for the family.